The world is likely at the beginning stages of a lithium super cycle where demand is far outstripping supply that will benefit lithium producers. Lithium producers and providers like Lithium Corporation. (OTCMKTS:LTUM), PURE ENERGY MINERA COM NPV (OTCMKTS:HMGLF), LITHIUM AMERICAS C NPV (OTCMKTS:LACDF), INTERNATIONAL LITH COM NPV (OTCMKTS:ILHMF), and ROCK TECH LITHIUM COM NPV (OTCMKTS:RCKTF) are about to see a huge increase in profitability as the demand for lithium is set to continue its upward trajectory. 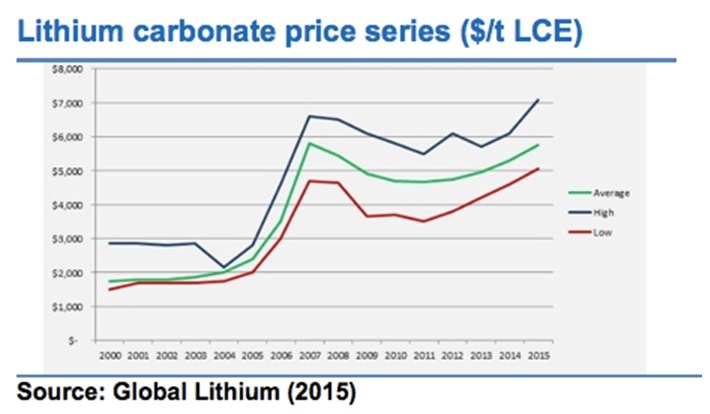 Lithium was one of the only commodities in 2015 to show positive price movement and continues its trend as prices have doubled. Lithium is a hot commodity that is seeing a surge in demand due to Tesla and the tech industry. Lithium is considered to be the new “white oil” and could see impressive gains as several bullish catalysts come to an inflection point. The battle for market share in and around this commodity has everyone from major tech players’ investor gurus vying for a foothold. 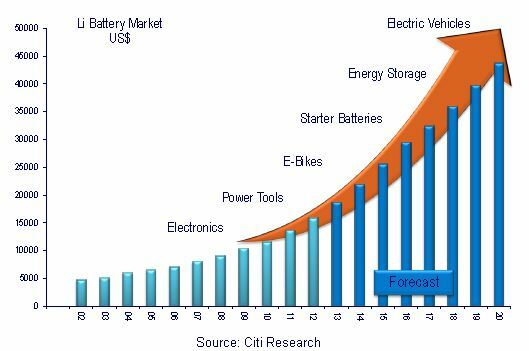 There are several factors driving demand including but not limited to the increase in battery gigafactories, the Powerwall by Tesla, a surge in electric vehicles driven by Tesla and other tech giants like Apple, Google, and Faraday Future, and the increase usage of lithium. Tesla is building a massive battery factor in Nevada which will require tons of lithium to support its operations. Last week Tesla announced its Model 3 which saw over 300,000 pre-orders. Tesla itself will drive a surge in lithium demand as it has plans to produce over 500,000 electric vehicles a year. Elon Musk stated that Tesla’s operations will likely use majority of the world’s current lithium supply. He commented, “In order to produce a half million cars per year…we would basically need to absorb the entire world’s lithium-ion production.” Tesla’s gigafactory will produce more lithium-ion batteries than the rest of the world combined. This is setting a new stage for lithium miners, and it’s all about new entrants to a space that is about to change exponentially like the fracking boom when demand for oil was outstripping supply. Big investors are definitively taking notice and even jumping into the game. One of Canada’s most noteworthy investors in the mining sector, Frank Giustra, is the latest to see lithium for what it is—the single-most valuable commodity of the tech-driven future. It is one that is already in short supply. According to The Economist, “the global scramble to secure supplies of lithium by the world’s largest battery producers, and by end-users such as carmakers”, among other things, has seen the price of lithium carbonate imported to China more than double just in November and December of last year alone, when it reached an amazing $13,000 per ton. Some contracts in China, according to Bloomberg, have seen over $23,000. Right now, most of the world’s lithium comes from Australia, China and the “Lithium Triangle” of Argentina, Chile and Bolivia. In North America, Nevada is the only player with a producing mine. Nevada has the best lithium which is found in the brine.